Watch the video presentation or read the transcript below. You’ll find accompanying material for this screencast available in a public GitHub repo — each screencast has a corresponding folder with a very simple theme that can be activated. But if you look closely, you might notice something has changed. Our changePost function has disappeared, and instead we are requiring the changePost function. If we go back to the containing directory, you can see that we also have a changepost.js file. This file now contains the changePost function. Note that at the bottom, we have a line that says module.exports = changePost. This is the CommonJS convention for defining what the module actually is. So when we require it, this ensures that what we require is the changePost function itself. 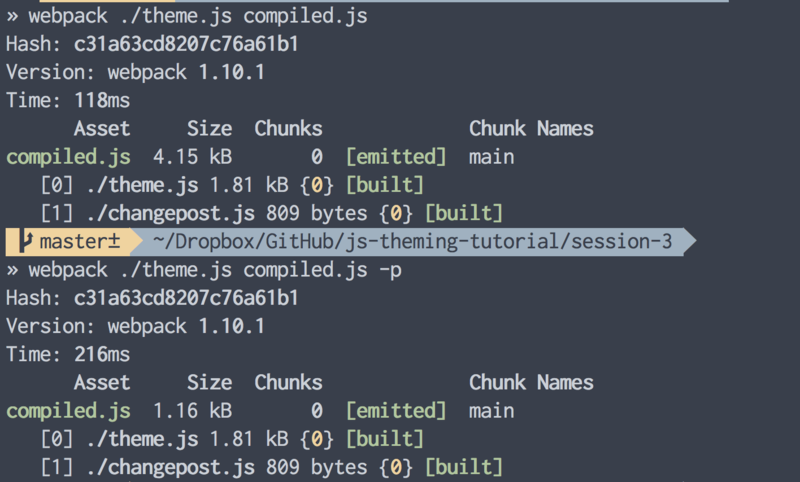 We can now view the compiled file and see that it contains the contents of both changepost.js and theme.js. An extra little bonus with Webpack is the -p flag, which simply means that you want to minify the file – remove whitespace and remove all comments etc. You can see that even this simple example our compiled file is almost a third of the size it was unminified. We can also add the -w flag which means we want Webpack to watch the files and automatically recompile whenever we change anything. With the file compiled, we can see everything in action working together. With everything we’ve looked at so far, you can probably imagine stringing together a theme that allows a user to browse through different chunks of content from their website. However, a major missing piece is routing, something that you may not have heard of. Routing broadly encompasses the way that we deal with URLs changing. Let’s say a user visits our site, clicks to a different post and wants to share the link. With the examples we’ve looked at so far, this isn’t possible. Routing also ties into our user’s history. If we have no routes, the user can’t press the back button. No routing also means we have little chance of anything meaningful being indexed by search engines. I’m sure you can now appreciate that routing is very important. Let’s look at something basic we can implement. If you look closely at changepost.js, you’ll notice that I’ve added a new line since the last tutorial. As well as editing the document on success, I’ve added a line that redefines window.location.hash. This is the most basic way of changing our user’s route. You’ve probably seen this used on other websites and it amounts to the same thing as using an anchor link to take the user to certain heading on a page. Let’s look at this in action. Our eventListener has been added to the first link in the menu. If we click it, note that the route now changes. So with some very basic routing, we now want to change what happens if the user clicks back. Will Somebody Please Think About the Search Engines?! This ties back into the search engine point, since we know that Google does take page-load times into account when ranking sites in search results. We really don’t want our load times to be three to four times longer than they need to be. In the next part of this tutorial, we’ll look at how to move from our basic theme to something more advanced, building from an altogether more stable foundation. WordPress theming hasn’t changed very much over the past few years. It’s certainly become more refined, and projects such as Underscores (_s) have helped promote best practices and robust standards. That said, we can still go as far back as Kubrick and find plenty of common ground with the most recent WordPress themes. Storing and pre-fetching content using the browser’s Web Storage API to allow server-less, seamless transitions — using the browser’s History API — between posts and pages. Animations within themes, for more natural and intuitive interactions. The ability to create entirely offline experiences using all new Service Workers. In this five-part tutorial, we’ll expose you to the brave new world that WordPress theme development might inhabit in the coming years. While the best practices for building a theme in this way are still to be established, we’ll do our very best to guide you into the secret garden of the future. Check out the video presentation or the written transcript below. First, we want to select something in the DOM. The two most common methods for doing this are getElementById and querySelector. They’re similar, except with querySelector we can select elements by their class. As its name suggests getElementById only allows us to select elements by their ID. With something selected, we could now change pretty much anything about it. This is basically what jQuery does behind the scenes. It’s also worth noting that there are/were some other players in the same field as jQuery, for example MooTools and YUI. If there’s one thing that has been making waves in the WordPress ecosystem this year, it is the new REST API. Officially known as WP-API, and currently available as a plugin, it is due to be rolled into core at some point this year. A REST API may not initially seem like a useful feature for theme developers. It is clearly very useful for those looking to use WordPress as an application platform, but how the REST API can be used within a theme is perhaps more opaque. The Theme Division at Automattic have had an eye on the potential uses of a REST API powering a theme for at least a couple of years now, and in recent months some concepts have started to take shape. Design: We can have smooth transitions between the different types of content on our websites. Speed: We can store content from the REST API in localStorage (effectively the browser’s memory). This means that on the initial site load we can store any post that is retrieved. Imagine a user clicking a ‘read more’ link and the full post being displayed without the need of a further server request. Recently, I have been talking about building themes with the REST API and our approach to building Picard at a number of WordCamps so far this year, culminating in a workshop at the inaugural LoopConf. Today, Picard is now publicly available on GitHub. We intend to continue developing Picard and working on some of the harder problems that we have not yet solved. We aren’t stopping at Picard either. Our experiments have led us in various directions. My colleague Kirk Wight has created another experimental theme called Tango. Tango is an extension of the concepts we are exploring with Picard, blended with the bulletproof Underscores starter theme. Learn how keyboard accessibility can serve as your foundation for an accessibility-ready theme, helping you create a solid base. When you build a house, you start with the foundation. It becomes the base upon which you form everything else around. Without it, your house could crumble because of improper construction. Web accessibility shares some of the same principles. You need a solid foundation to have an accessible website and WordPress theme. Keyboard accessibility can serve as your foundation for an accessibility-ready theme, helping you create a base that you can build on with confidence. Once you have it in place, accessibility becomes easier as you go. But where do you start? You can tackle any of the four principles below one at a time. Pick one, practice implementing it in your next theme, and you’ll see the benefits. Bringing these to your project matters more than mastering them in any specific order. With modern web accessibility, there are many ways in which keyboard accessibility can become difficult or impossible. Fortunately, keyboard testing is easy – simply put the mouse away and test the page using only a keyboard. The tab and shift + tab keys can be used to navigate through links and form controls, and Enter can be used to activate links, buttons, or other interactive elements. Who uses the keyboard every day on the Web? People who are blind use it almost exclusively. People with low vision may also use it if a page can be enlarged and the contrast is high enough. Those with motor disabilities often can’t use a mouse. Alternative devices also come into play too, like those that allow users to “puff and sip,” and work with airflow from the mouth. These devices interact with the computer similar to a keyboard, so they benefit from proper keyboard accessibility. Keep your source order in mind. 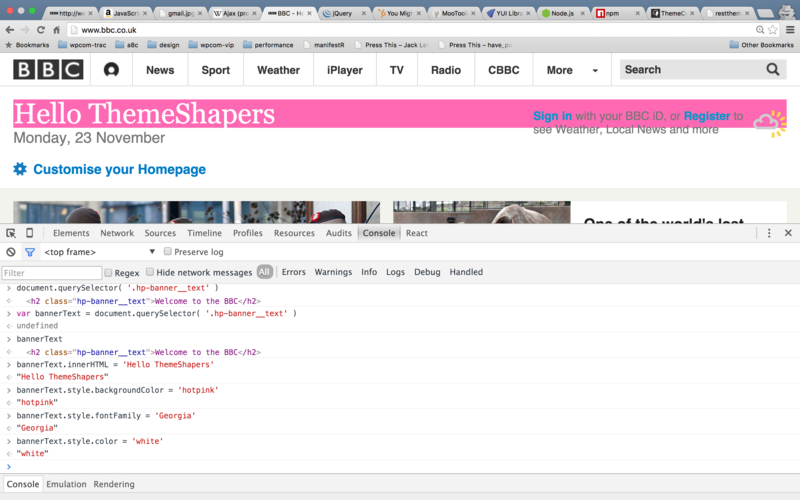 Source order means how your HTML is ordered and how it flows on the page. As you create your theme, make sure that it’s logical. Turning off CSS provides a good, simple way to test this. Once everything on the page becomes linearized, does it still make sense? Having a thin, dotted outline on :focus is considered the default focus style in most browsers. It’s a good place to start, but if you’d like something different, you can design it. However, do not completely remove focus styles by setting outline: 0. That leaves your theme unusable by people who depend on the keyboard. Focus states can often mimic hover states, but they do not have to be identical. The important point here is that they do not rely on color alone. Many users have varying degrees of color blindness and/or low vision. Relying on color alone can become problematic. Using an outline, border or some other kind of shape helps your focus styles shine. Underscores, our starter theme available at Underscores.me, has basic focus styles and a keyboard accessible menu toggle built right in. Let me know if you have any questions in the comments. Happy theming with accessibility in mind! Eventbrite and WordPress are the perfect fit, but until now, integrating the two has not been for the faint of heart. In early 2014, Eventbrite announced its new upcoming REST API, and this became the perfect opportunity to give theme developers an easy-to-use set of tools for working with Eventbrite events: the Eventbrite API plugin. While the Eventbrite API plugin can display events in any theme, events look their best if the theme declares support and provides tailored templates. This simple process guarantees that events fit perfectly with the theme design, and adding support should take no more than ten minutes. Add a support declaration, hooked to after_setup_theme. There are no arguments, and usually this can be added to a theme’s existing setup function. * Add theme support for the Eventbrite API plugin. Create an eventbrite folder in your theme, and copy over the plugin’s main template files (tmpl/eventbrite-index.php and tmpl/eventbrite-single.php). Compare the markup in eventbrite-index.php to your own index.php and adjust as necessary. Also, verify that your markup for archive titles matches the Eventbrite template’s page title. The Eventbrite templates don’t use template parts for the post markup, so you may need to compare with content.php or the like. Of course, there’s no reason you couldn’t add a content-eventbrite.php to your theme, if you prefer. Repeat step 3 with eventbrite-single.php and your own single template. That’s it! If support is declared, the plugin will use those templates if they exist, or fall back to the plugin’s templates. To see some custom templates in action, check out any of the Twenty* default themes; their templates are included in the plugin. Eventbrite integration with Twenty Fifteen. It was important to us that working with the Eventbrite API plugin should be a simple and familiar process for theme developers, with a low barrier to entry. With that in mind, we developed the Eventbrite_Query class, so fetching and displaying events is as simple as making a secondary loop (in fact, the class extends WP_Query). This allows for easy creation of special-purpose loops, widgets, creative page templates – any combination of events you want to display in a theme. // Get the next three unpublicized events for the Apollo Planetarium. There are a few things to keep in mind while working with Eventbrite_Query loops. You can continue to use familiar template tags in event loops, such as the_post_thumbnail(), the_title(), the_content(), etc. They’ve simply been filtered to provide content from the current event. For technical reasons, a few template tags need their Eventbrite equivalent, such as eventbrite_is_single() and eventbrite_edit_post_link(). Being a secondary loop, don’t forget to add wp_reset_postdata() at the end. All of the plugin’s template tags are pluggable, and filters exist at various points for further customization. If you’re happy processing your own results, and just want an easy-to-use set of tools to handle the API requests, the included helper functions are for you. Each supported API endpoint has its own helper function, and these functions in turn use the Eventbrite_Manager class for the heavy lifting. Not only does this class make the actual API requests, but also handles validation and transients, so you can concentrate on results rather than mechanics. The Eventbrite API plugin is developed on GitHub, and issues or questions can be posted there or in the forums. Additional info and documentation can be found here. Along with the Eventbrite Services plugin, it’s never been easier or more fun to display events in your WordPress website. Let us know what you’re doing with Eventbrite, and tell us if there’s anything the Eventbrite API plugin can do to make your Eventbrite integrations easier for you! The Eventbrite API plugin requires the Keyring plugin for managing OAuth2 authorization to Eventbrite. If you get stuck, check out our detailed instructions for getting connected to Eventbrite.